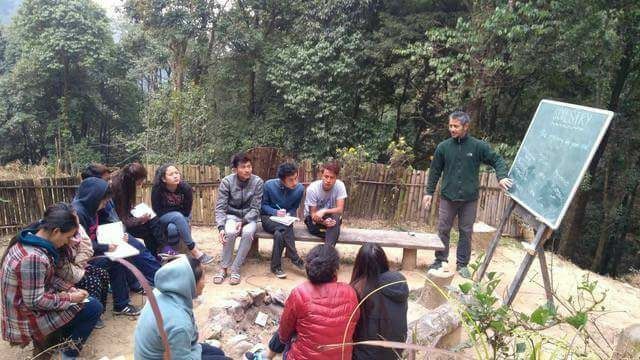 Sonada — In a first time effort, a local NGO and a hills college, teamed up to experiment on an eight-day socio-ecological outreach programme for students, 19 to 26 February 2018. They cleaned up some 150 meters of the source of 8th Mile mountain river which supplies water for Kurseong town. The NGO Tieedi Forest Garden Gorabari and Salesian College Gorabari NSS group organised the eight-day residential and experiential learning workshop for 12 students. “The workshop aimed to reconnect students to nature and the community through socio-ecological outreach programmes especially to befriend and heal an ailing river at 8th Mile on NH 55 – the old Hill Cart Road between Gorabari and Chattakpur villages,” says Utsov Pradhan one of the NGO Tieedi (Take it easy, easy does it). “Highlights of the camp included an Ecological Survey of the 8 Mile village; setting up of a fire-place and foraging for deadwood for the wood-fire to cook meals; grocery shopping for the week-long programme; cooking outdoors team activity, and sharing the learnings from the protracted observation during the ecological survey,” says one of three boys in the group first year BA student Gaurav Rai. During the brainstorming session on what students could do to #BeTheChangeYouWishToSee, they unanimously opted to transform their college into a ‘Green College’. Hence, on the fifth day, the team went to review the green meter of the college so that the students could take forward and implement some of their learnings of the week. In the afternoon, it was a hike in the pristine forest trails of Senchel Wildlife Reserve above the college with a session on personal wellbeing and fitness being thrown as one of the conversation topics. On the way back, the students cleaned-up and picked all the trash along the way in the Old Military Road and Rajahatta village. The day finally ended with a musical evening with a bonfire at Dzomsa – the meeting place in the forest at Tieedi. Seventh-day was the Ideas Execution Day! In the morning session, the students had a meeting to bring forth all the ideas that were brought to the table after the socio-ecological survey of 8 Mile. The day ended with the making and the launch of their song – ‘Hamro Darjeeling’ (Our Darjeeling) – a deeply heartfelt shout-out to all Darjeeling lovers to unite and save the hills!